[Doctors Express] – Doctors Express, the first national urgent care franchise, is expanding its presence into Santa Clarita in just a few weeks. Santa Clarita physician Dr. Paolo Hernandez joined the group as the Medical Director and is partnering with former business executives Curtis and Lupe Hafner to open and operate the new urgent care facility, combining clinical excellence with business savvy and a singular focus on patient service. The team plans to establish a high quality, state-of-the art, walk-in medical center that is comfortable, convenient and affordable for patients. The new Doctors Express Santa Clarita will open in July on Soledad Canyon Road and Hidaway Avenue in the heart of Canyon Country. The highly anticipated grand opening will take place on Saturday, June 30th. All Canyon Country residents are encouraged to attend. The event will be held from 10am-2pmat the new location complete with giveaways, kids’ activities and fun for the whole family. The Doctors Express walk-in medical center differs from other medical clinics by offering a consistent, broad range of treatment and services on the spot. With an average wait time of 15-20 minutes, along with on-site X-Ray and laboratory, make treatment much quicker than most other urgent cares. In addition to common ailments such as strep throat and broken bones, the center will also provide occupational health services, such as pre-employment physicals, employer drug testing, employer workers compensation assessment and treatment as well as regular sports physicals. The national franchise will benefit the local Doctors Express by sharing best practices across all centers and leveraging its size to keep prices lower for local consumers. Dr. Hernandez will oversee all of the day-to-day medical operations of the center. Dr. Hernandez is Board Certified in Family Medicine and proudly served in the US military from 2003-2007, he deployed to Iraq and later to Afghanistan where he provided medical support and worked as a physician mentor to help open a brand new hospital for the Afghan police. Dr. Hernandez has always worked to expand his experience in Emergency Medicine and has worked in different emergency departments. He brings a high level of experience and professionalism to the center and is looking forward to serving the community of Canyon Country. 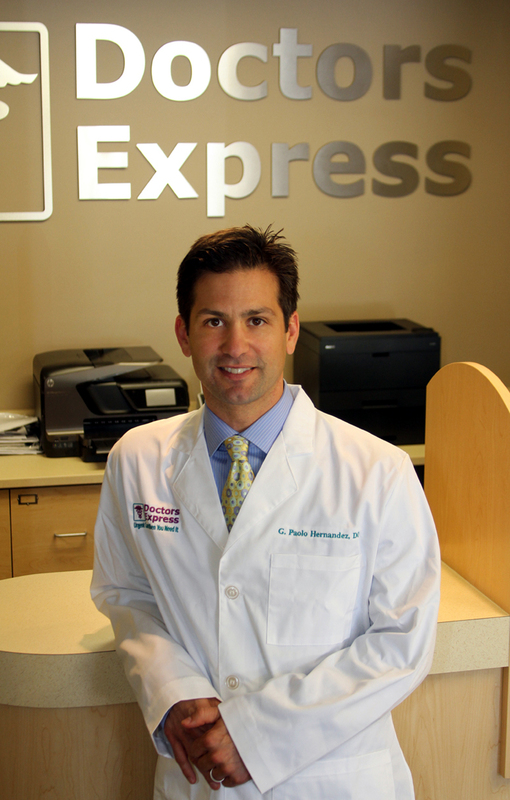 Doctors Express was founded in Baltimore in 2006 by Dr. Scott Burger, an emergency room physician, seeking a more efficient, affordable and personable system of care for urgent care patients. Doctors Express walk-in medical centers are sweeping across the country as America’s first nationally branded urgent care centers. It is estimated that over 20% of patients treated in the emergency room could be seen at an urgent care center with significantly shorter wait times, comparable treatment at much less cost. Unlike other urgent care centers,at Doctors Express a patient will always be seen by a Board Certified Physician. Doctors Express provides state-of-the-art treatment for acute illness, trauma and sports injuries (including minor surgical procedures) and has on-site laboratory, digital X-Ray and prescription services. Visit www.DoctorsExpress.com.